Richmond was laid out in 1737. Richmond was served by at least two water systems in the early 1800s. The Richmond Aqueduct was formed in 1803 and it or another company were building works in 1809. One of more hydraulic rams were offered to the town in 1805 by M. La Paype, but no further information has been found about them. The Richmond Aqueduct Company was incorporated in 1823 with William Foushee, Sr., Robert G. Scott, John G. Williams, James Rawlings, Benjamin Tate, William H. Hubbard, John Goddin, Christopher Tompkins, and John Rutherfoord appointed as stock subscription agents. The company's charter was revived in 1825, but they do not appear to have built anything. In 1829, Richmond was authorized to construct its own water works, and engaged Albert Stein to design and construct them. The works were completed in 1832 and included a filtering bed, although Stein was "doubtful of its proving a success." Nevertheless this is the first attempt to filter a public water supply in the United States. Map of Water Works for the City of Richmond, Virginia, 1830. 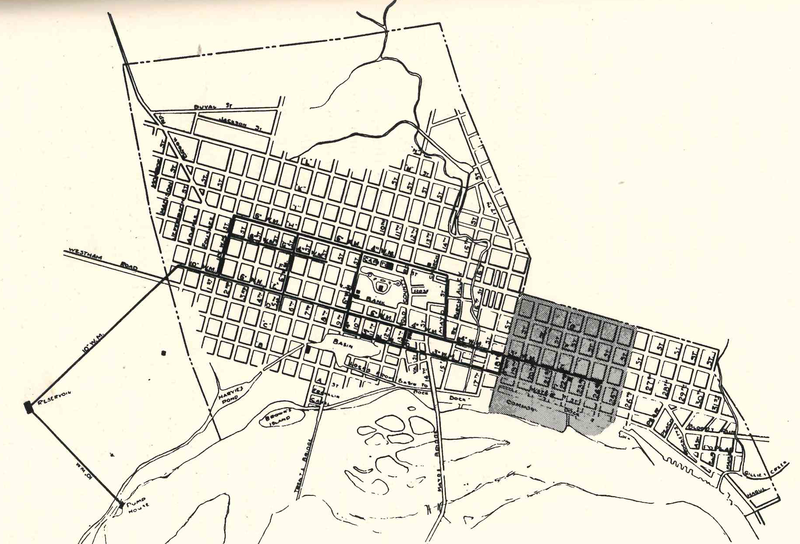 The shaded portion is the original town established in 1747.
from Watering the City of Richmond (1930), Page 29. The waterworks are currently owned by the City of Richmond. Notice The Subscribers to the Richmond Aqueduct are particularly requested to attend a meeting to be held at the Bell Tavern, on Tuesday next, at 5 o'clock in the afternoon. 1823 An act incorporating the Richmond Aqueduct Company, January 30, 1823. 1825 An act to revive and amend “an act incorporating the Richmond Aqueduct Company, passed the thirtieth of January, eighteen hundred and twenty-three.” February 10, 1825. 1829 An act to authorize the Common Council of the city of Richmond to cause said city to be supplied with water in certain cases, and to impose taxes to defray the expense thereof. January 29, 1829. 1830 "Water Works," Richmond Enquirer, July 20, 1830, Page 3. Vote in favor of water works 317; against 108. Water Works for the Supply of Richmond -- The Richmond Compiler states, that every arrangement is making for expediting the progress of the works. The iron pipes are laid down, and covered over, in several of the upper streets of the city. The reservoirs [to have two apartments each and three filters,] are digging with great rapidity. The foundation of the stone pump-house is said to be most substantially and handsomely built, on the edge of the James river bank, below the canal -- and several hundred feet from the reservoir. Within less than one hundred yards of from the pump-house, the dam is commenced -- to stop the water in on one great sluice of the river, and direct it down a channel to be called in on the off side to pour the water upon the works of the pump-house. 1831 An act concerning the water works in the city of Richmond. March 23, 1831. 1832 An act providing for a supply of water for the use of the Penitentiary and the public buildings on the capitol square. March 3, 1832. Pages 191-192: Richmond. The remaining expenses are on account of the public markets, fire companies, salaries of officers, paving of streets and various contingencies. The city debt at this time amounts to $136,150;— $95,000 of which, bearing an interest of 5 per centum only, was incurred on account of the water works. These works were commenced in September 1830, under the direction of Albert Stein, an accomplished Engineer from Holland, and were completed as far as originally designed, at the end of the ensuing year. Since that time, a second pump and wheel, and a third reservoir have been added; making the cost of the whole work about $100,000. The pumps are each calculated to raise from the river, and propel into the reservoirs at a distance of 800 yards, and at a considerable elevation 400,000 gallons of water in 24 hours. These pumps are designed to operate alternately, either being competent to fill the reservoirs in sufficient time. The reservoirs will each of them contain 1,000,000 gallons,—and double lines of pipes extend from them to the pump house on the margin of the river. The main pipe from the reservoirs to the intersection of H. and 1st streets is 2,058 yards in length; and the smallest pipes extend from this thro' the principal streets, lessening in diameter to the point of greatest depression from the level of the reservoirs, a distance of about 3 ms. Fire plugs are placed at convenient distances along the line of pipes, and afford an ample supply of water for extinguishing fires. In the lower part of the city the pressure is sufficient to force the water to the tops of the houses through hose, without the aid of engines. Three hundred and forty houses and tenements are already furnished with water, and the rents which are daily increasing, amount at this time, April 1834, to $4,000. The annual expense of superintendence, &c. is $1,000. These works may justly be considered the pride of the city. The water which they supply is not only pure and wholesome, but for a considerable part of the year is sufficiently clear to be used without filters. Page 288-289: The supply of water for the town of Richmond in Virginia, is procured from the James River, in the same manner as at Philadelphia; but the works are on a much smaller scale. The water is raised 160 feet by two water-wheels into two reservoirs, measuring 194 feet in length, 104 feet in breadth, and ten feet eight inches in depth, which are capable of containing upwards of two millions of gallons of water. Before leaving the reservoirs, the water is purified by passing through two gravel filters. The water-wheels are eighteen feet in diameter, and ten feet in breadth, and the fall is ten feet. The barrels of the two forcepumps are nine inches in diameter, and six feet in length of stroke, and, in the ordinary state of working, when only one wheel is in operation, raise about 400,000 gallons of water in twenty-four hours. The cast-iron main which leads from the pumps to the reservoir is eight inches in diameter and about 2400 feet in length. Mr Stein was engineer for the work, which is said to have cost about £20,000. Page 304-305: Thus also by private subscription, water was conducted from the basin in wooden pipes as far as the market bridge, with hydrants at several corners, always flowing. Myriads of minute eels would ascend the moist wall of the bridge and wriggle their way to the very spouts of the hydrants. By similar pipes, water was conveyed from the Bloody Run Spring (not then a sanguinary stream) as far as the Bell Tavern. Some of these are yet conduits, a short distance from their source. In excavating the streets, the pipes are frequently found and in perfect preservation from decay — after fifty years' interment of those from the basin. About twenty-five years after the wooden water-pipes were laid, and when the increased population of the city had rendered many of the wells unfit for use, the river was put in requisition to pump a portion of its own water to an elevation higher than the city, and from its reservoir there, to circulate by subterranean channels to each domicile; though not always in a transparent state. 1872 Annual Report of the Watering Committee of the City of Richmond, February 1st, 1872. 1873 Annual Report of the Watering Committee of the City of Richmond, February 1st, 1873. 1874 Annual Report of the Watering Committee of the City of Richmond, February 1st, 1874. 1874 Annual Report of the Watering Committee of the City of Richmond for the year 1874. 1882 Richmond, Va., Water-Works, from Engineering News 9:229 (July 8, 1882) Description of new water works. 1885 Annual Report of the Superintendent of the City Water-Works to the Mayor of the City, for the Fiscal Year Ending December 31st, 1885. 1886 Annual Report of the Superintendent of the City Water-Works to the Mayor of the City, for the Fiscal Year Ending December 31st, 1886. 1887 Annual Report of the Superintendent of the City Water-Works to the Mayor of the City, for the Fiscal Year Ending December 31, 1887. 1888 Annual Report of the Superintendent of the City Water-Works to the Mayor of the City, for the Fiscal Year Ending December 31, 1888. 1888 "Richmond," from Manual of American Water Works, Volume 1. 1889 Annual Report of the Superintendent of the City Water-Works to the Mayor of the City, for the Fiscal Year Ending December 31, 1889. 1890 Annual Report of the Superintendent of the City Water-Works to the Mayor of the City, for the Fiscal Year Ending December 31, 1890. 1890 "Richmond," from Manual of American Water Works, Volume 2. 1891 Annual Report of the Superintendent of the City Water-Works to the Mayor of the City, for the Fiscal Year Ending December 31, 1891. 1891 "Richmond," from Manual of American Water Works, Volume 3. 1892 Annual Report of the Superintendent of the City Water-Works to the Mayor of the City, for the Fiscal Year Ending December 31, 1892. 1893 Annual Report of the Superintendent of the City Water-Works to the Mayor of the City, for the Fiscal Year Ending December 31, 1893. 1894 Annual Report of the Superintendent of the City Water-Works to the Mayor of the City, for the Fiscal Year Ending December 31, 1894. 1895 Annual Report of the Superintendent of the City Water-Works to the Mayor of the City, for the Fiscal Year Ending December 31, 1895. 1896 Annual Report of the Superintendent of the City Water-Works to the Mayor of the City, for the Fiscal Year Ending December 31, 1896. 1897 "Richmond," from Manual of American Water Works, Volume 4. 1899 Annual Report of the Superintendent of the City Water-Works to the Mayor of the City, for the Fiscal Year Ending December 31, 1899. 1900 Annual Report of the Superintendent of the City Water-Works to the Mayor of the City, for the Fiscal Year Ending December 31, 1900. 1901 Annual Report of the Superintendent of the City Water-Works to the Mayor of the City, for the Fiscal Year Ending December 31, 1901. 1902 Annual Report of the Superintendent of the City Water-Works to the Mayor of the City, for the Fiscal Year Ending December 31, 1902. 1903 Annual Report of the Superintendent of the City Water-Works to the Mayor of the City, for the Fiscal Year Ending December 31, 1903. 1904 Report of the Committee on Water Submitted to the Common Council May 2, 1904 relating to Electrolytic Damage to the water mains and pipes of the City of Richmond. 1904 Annual Report of the Superintendent of the City Water-Works to the Mayor of the City, for the Fiscal Year Ending December 31, 1904. 1905 Annual Report of the Superintendent of the City Water-Works to the Mayor of the City, for the Fiscal Year Ending December 31, 1905. 1906 Annual Report of the Superintendent of the City Water-Works to the Mayor of the City, for the Fiscal Year Ending December 31, 1906. 1907 Annual Report of the Superintendent of the City Water-Works to the Mayor of the City, for the Fiscal Year Ending December 31, 1907. 1919 First Annual Report of the Department of Public Utilities for the City of Richmond, Virginia for the Year Ending December 31, 1919. 1920 Second Annual Report of the Department of Public Utilities for the City of Richmond, Virginia for the Year Ending December 31, 1920. 1921 Third Annual Report of the Department of Public Utilities for the City of Richmond, Virginia for the Year Ending December 31, 1921. 1922 Fourth Annual Report of the Department of Public Utilities for the City of Richmond, Virginia for the Year Ending December 31, 1922. 1923 Fifth Annual Report of the Department of Public Utilities for the City of Richmond, Virginia for the Year Ending December 31, 1923. 1924 Sixth Annual Report of the Department of Public Utilities for the City of Richmond, Virginia for the Year Ending December 31, 1924. 1925 Seventh Annual Report of the Department of Public Utilities for the City of Richmond, Virginia for the Year Ending December 31, 1925. 1926 Eighth Annual Report of the Department of Public Utilities for the City of Richmond, Virginia for the Year Ending December 31, 1926. 1927 Ninth Annual Report of the Department of Public Utilities for the City of Richmond, Virginia for the Year Ending December 31, 1927. 1928 Tenth Annual Report of the Department of Public Utilities for the City of Richmond, Virginia for the Year Ending December 31, 1928. 1929 Eleventh Annual Report of the Department of Public Utilities for the City of Richmond, Virginia for the Year Ending December 31, 1929.